The most famous Japanese actors appearing in samurai pictures are Toshiro Mifune and Tatsuya Nakadai. There is also a third name, far less familiar to American audiences: I am thinking of the late Raizo Ichikawa (1931-1969), star of jidai-geki productions from the Daiei Studio. My favorite character he played was that of Kyoshiro Nemuri, a.k.a. 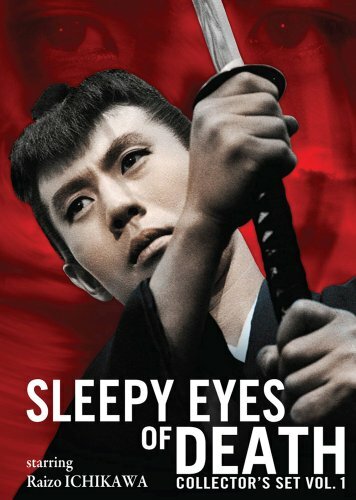 “The Sleepy Eyes of Death,” a Japanese born of a Christian father during a black mass, He is also referred to as a Son of the Black Mass. In his films, he regards the Christians baptized by the Portuguese as hypocrites. His signature sword move was the Half-Moon Cut, against which his opponents were all but powerless. Note the strange cross symbol on his costume. Now that I am semi-retired, I would like to pick up as many of the Kyosiro Nemuri films as I can find. It wouldn’t be too difficult, but I would definitely need English subtitles. 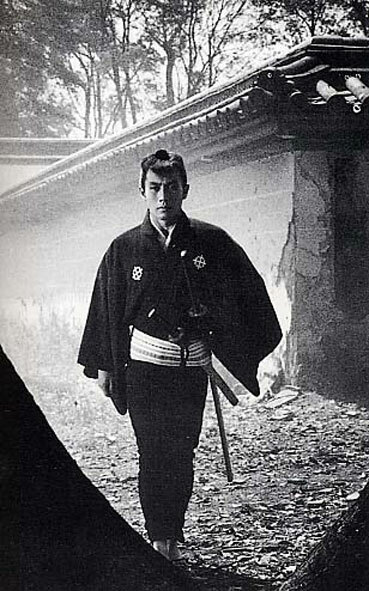 During the 1960s and 1970s when I went downtown with friends to the Sho Tokyo and Kokusai theaters (which played nothing but Daiei films) on an almost weekly basis, I always considered myself lucky to see Ichikawa in any role, but especially as Kyoshiro Nemuri. The directors of the series included such names as Kazuo Ikehiro (the best), Kenji Misumi, and Issei Mori. Unfortunately, Daiei and most of the other Japanese studios disappeared during the obscene run-up in real estate values from 1986 to 1991. More’s the pity. During the 1960s, I believe that the best films that were being made anywhere were the Japanese samurai pictures. And Raizo Ichikawa was, to my mind, the best of the actors.